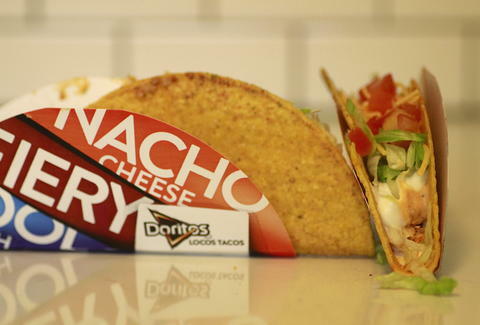 In the Year of Our Lord 2012, Taco Bell created the Doritos Locos Taco. And it was good. 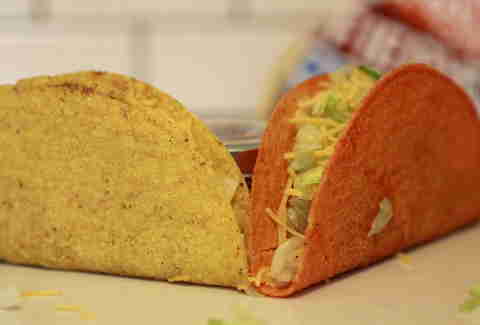 And by good we mean great... by simply orange-ing up the shell and sprinkling on Doritos powder, Taco Bell scored big. More than 825mil DLTS big. In the past two years, both Cool Ranch and Fiery have hit with varying degrees of fanfare, but nothing has trumped the game-changing original. This week, Taco Bell threw down another DLT with the Spicy Chicken Cool Ranch Doritos Locos Taco, which ditches the beef in favor of shredded chicken covered in a creamy Fiery sauce. But how does it stack up? We hit FourthMeal to find out. 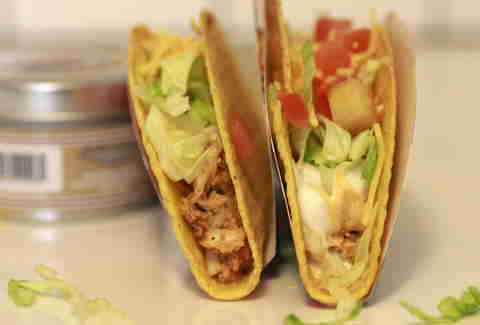 I have to admit, the thought of shredded chicken on T-Bell had me worried that I'd miss that oh-so-finely ground beef, but the chicken is surprisingly tender and meaty, with a nice hint of peppers up front. Chicken and ranch are natural bedfellows -- thus the age old question, "which came first, the chicken or the Hidden Valley?" -- so, between the seasoning on the shell and the ranchy Fiery sauce, this works well. Heat I am very admittedly not a spice man, but whatever. Taco Bell has never put the hurt on me. Until right now. At first bite, it’s mild. Then it gets pretty aggressive. Maybe it’s the sauce, which appears to be chili-spiked ranch. Maybe I just have the tongue of a 4-year-old girl. Either way, this has a definite, unexpected kick. But the kick is short-lived. I'm a "regular" guy with the Nacho Cheese original; the sour cream and tomatoes only mute the ambrosia that is the Doritos powder. Here, though, supreme makes sense, because the sour cream and tomatoes' acidity cut through the spice. Those elements work better with chicken than beef. Also, again... tongue of a 4-year-old girl. No contest. Nothing in the world is better than Nacho Cheese Doritos. Even in taco form. Period. The new chicken DLT is a step up from its Cool Ranch beef counterpart, with the ranch flavors are more pronounced and pair much better with chicken than cow. However, nothing can, or will, ever trump the original. But if you're getting a taco 12-pack, it's definitely worth throwing a couple Spicy Chicken Doritos Locos Tacos into the mix for a little variety. Andy Kryza is a senior editor on Thrillist's food and drink team and just fell off the wagon in his Taco Bell rehab. Follow him to to recovery via @apkryza.